Apple says the MacBook Air is its most beloved notebook, and it’s easy to see why. When it made its debut 10 years ago, it changed the entire portable computer industry, packing all the power of a Mac into a form factor that was thinner and lighter than ever before. 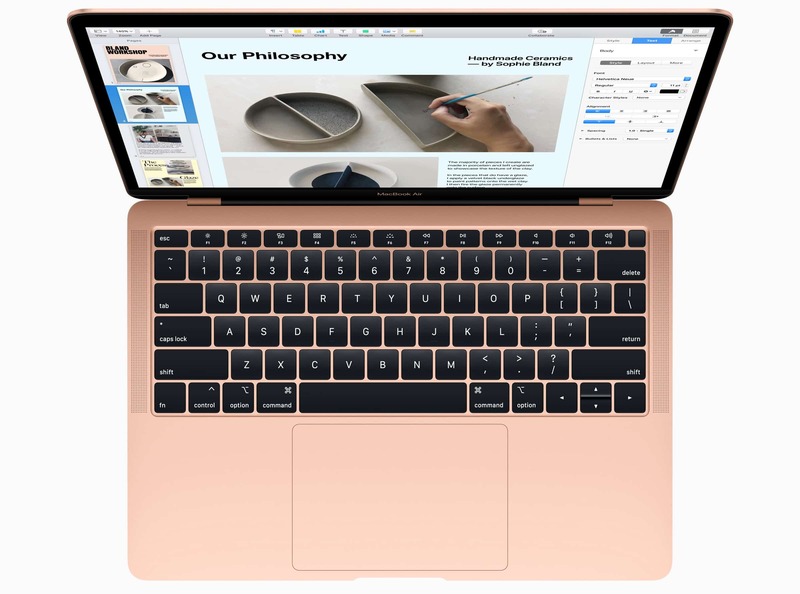 In recent years, the MacBook Air has been somewhat neglected as Apple focused its attention on the 12-inch MacBook, redesigning the MacBook Pro, and new desktops. But it was an entirely different story at its There’s More in the Making event in New York City today. When Tim Cook took to the stage to show off the new machine, it became clear there’s plenty of life left in the MacBook Air. It certainly isn’t a forgotten product for Apple anymore. 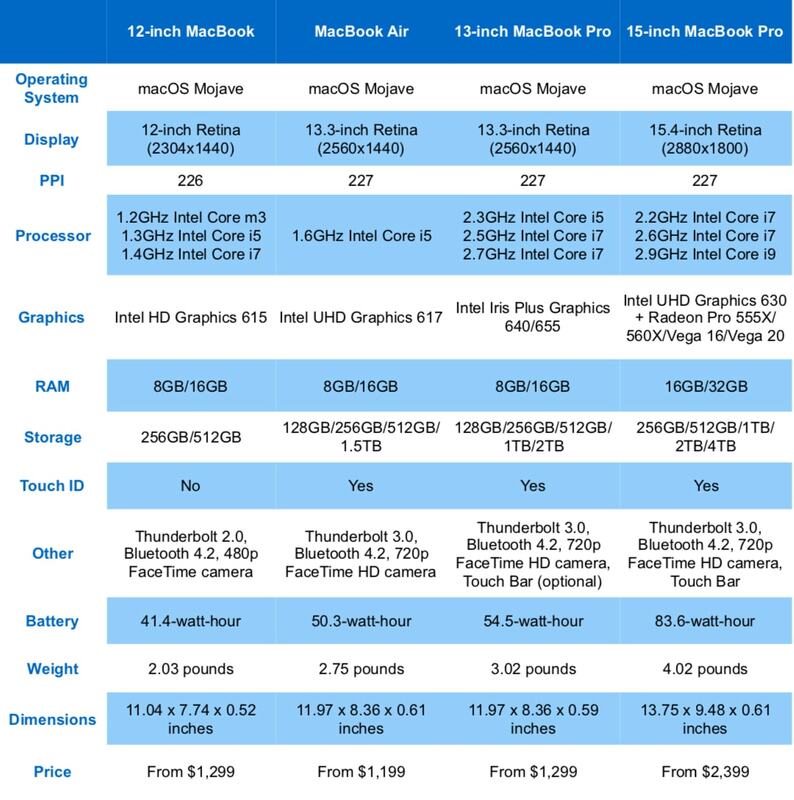 Here are the specifications available for the new MacBook Air, and how they stack up against those for the 12-inch MacBook and MacBook Pro. As you can see, the new MacBook Air isn’t just improved on the outside. Everything about it is better on the inside, too. 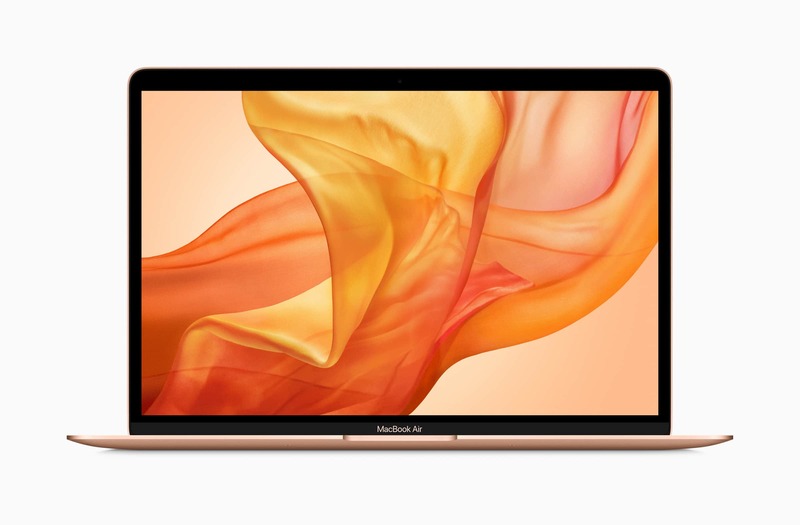 It now offers a stunning Retina display, the latest features like Touch ID and Apple’s T2 security chip, and eighth-generation Intel processors with faster graphics. Before we get onto which Apple laptop is right for you, we should go ahead and take the 12-inch MacBook out of the equation early. There’s really no reason to buy a 12-inch MacBook right now unless for some reason you simply have to have a 12-inch display and no other size will do. Not only is the new MacBook Air cheaper, but it’s better in every way. The MacBook Air’s display is larger at 13.3 inches. Plus, it packs a bigger battery for a longer runtime in between charges. It ships with a faster dual-core Core i5 processor as standard — not a sluggish Core m3 chip — with the latest Intel UHD Graphics 617. The new MacBook Air looks simply stunning. The MacBook Air also offers up to 1.5TB of storage — three times as much as the MacBook’s maximum capacity. And it comes with twice as many USB-C ports. We should also point out that those USB-C ports support the latest Thunderbolt 3 standard, unlike the MacBook’s. It’s difficult to see where the 12-inch MacBook fits into Apple’s lineup now. It was the ultimate ultraportable. But now, at $100 more than the more powerful MacBook Air, it really makes no sense whatsoever. It’s a surprise Apple still sells it — especially at $1,299. So, that leaves us with the MacBook Air and the MacBook Pro. Which MacBook is the one for you? Choosing between the MacBook Air and the MacBook Pro is easy. And since they start at a similar price now, you don’t need to rule out one based on your budget. All you need to think about is what you’ll use it for, and where you’ll use it. If you need a machine for writing, email and other everyday computer tasks that you can take with you wherever you go, you should probably buy the MacBook Air. There’s certainly no reason to consider the MacBook Pro solely for its Touch Bar. The new MacBook Air packs Apple’s latest butterfly keyboard. If you need a machine that can tackle video editing, music creation, animation and maybe even some light gaming — and that doesn’t need to go with you wherever you go — you should probably buy a MacBook Pro. I say “probably” because there are some things to consider here. Although the new Air isn’t as powerful as the Pro lineup, its new chips will allow it to handle things like photo and video editing. It just won’t perform those tasks quite as quickly. For the vast majority of people, a new MacBook Air is probably all you’ll ever need — and it delivers incredible value at $1,199. But if you want maximum power because the things you do every day demand that, the Pro remains a better option.